The geology of Santa Barbara County is truly unique. When viewed at high altitude, the Santa Barbara coastline appears as a massive peninsula shaped in the profile of Ronald Reagan's head jutting out into the Pacific Ocean. The marine influence on the wine-growing regions of Santa Barbara is greatly enhanced by the east/west oriented, transverse coastal mountain ranges, which allow fog and cool maritime air to travel inland unimpeded. The three American Viticultural Appellations (AVAs) that exist within Santa Barbara wine country are Santa Maria Valley, Santa Ynez Valley, and the Santa Rita Hills. There will likely be additional AVAs created in the future, such as the Los Alamos Valley and Happy Canyon. 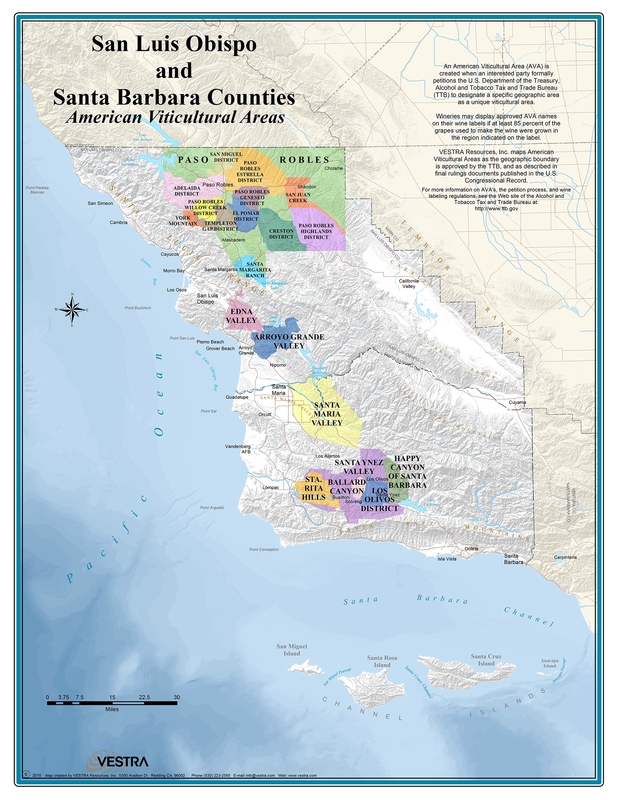 The larger AVA of which all Santa Barbara wine country is part is the umbrella AVA of "Central Coast".